Satin Mahogany Knabe Baby Grand. The piano was completely rebuilt and refinished in 1989 with new hammers and strings making it a great piano for the price. Includes bench and one in-home tuning. $3900. Excellent reconditioned and beautiful sounding semi-concert Kawai grand piano with bench. Ideal for school, church or professional players. The piano is currently used in a local recording studio and can be seen by appointment only. The owner needs room for another large grand and this one needs to move. The Kawai KG-6C grand normally sells for twice the price, so take advantage of this this spectacular deal today! The piano has new bass strings and new dampers. Buy it today for $7500. 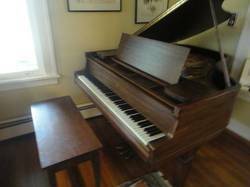 Wonderful sounding reconditioned grand piano for the family on a budget. Recently tuned and in great condition priced to sell at $1,095. Lovely Baldwin Acrosonic spinet! This popular model of spinet piano is the smallest and best sounding available! It fits incredibly well in the smallest of homes and spaces and has a lovely mellow bright tone. This piano features a beautiful satin brown mahogany finish. Priced at $950. Climate controlled entire time. Priced at $2,500. Young Chang PG-185 Grand Piano with matching bench. It is finished in high polished ebony.The finish is in excellent condition. This piano was built to the highest standards in South Korea. The piano has been tuned regularly with the action extensively regulated and voiced. The action is very responsive. Priced at $7,999.